DeM Banter: rough situation…options limited…lines drawn…tired military….limited funds…now what? Syria is testing the idea that nations can’t cross the United States. What happens if other countries copy it? The United States can’t bluff. That is the consensus inside the White House on the issuing of “red lines,” including President Obama’s publicly declared prohibition against Syria using or transferring its chemical weapons, or Iran acquiring a nuclear bomb. Immediately after Israeli and British officials announced last week that the regime of strongman Bashar al-Assad had apparently crossed the red line and used chemical weapons against Syrian rebels, hawks in Congress and allies in the region put intense pressure on the administration to back up its threats with military action. Within days, reports surfaced that Obama was preparing to send lethal weaponry to the Syrian opposition, a risky escalation of U.S. involvement in the conflict that the administration has resisted for two years. Top officials are concerned enough about Russian reaction to the move that they have dispatched Secretary of State John Kerry to Moscow. In a news conference this week, Obama made it clear that if Syrian use of chemical weapons is proven, the red line will be honored and action taken. Expert opinion varies widely on whether more-assertive U.S. leadership in the Syrian crisis is wise, or whether it is misguided policy. With another red line on Iran’s nuclear program looming as early as this year, however, it’s worth considering the risk-versus-reward equation when trip wires are placed around complex diplomatic crises. If the stakes are unusually high, the red line particularly bright, and the commitment to act firm, these kinds of ultimatums can be a useful deterrent. In crises where the facts are murkier and the commitment more situational, however, they can blow up in your face. Indeed, some of the drawbacks of demarcating firm red lines are already evident in the Syrian crisis. The news that Assad had likely used chemical weapons was first revealed by Israel, which has its own reasons for forcing Washington’s hand. 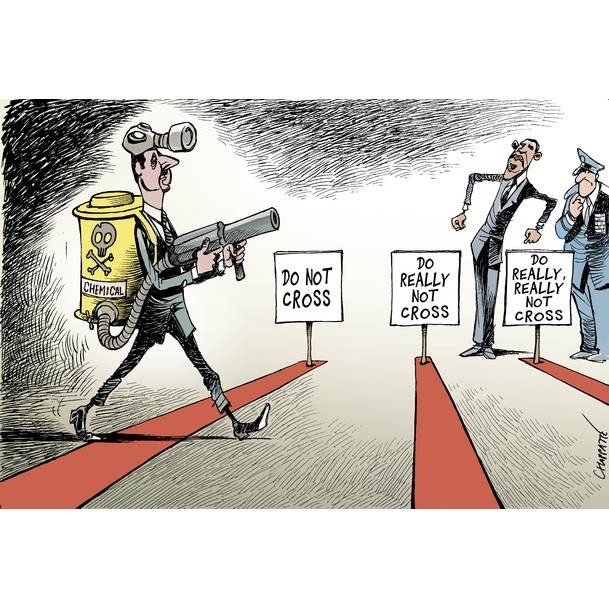 Setting the trip wire at the use of chemical weapons might also be interpreted by the Syrian regime as implying that anything short of the mark is permissible, up to and including slaughtering 80,000 Syrians with conventional arms. In the case of Iran, there’s ample evidence that Tehran is gaming both the U.S. and Israeli red lines, producing just enough enriched uranium for a rapid “breakout” capability if it decides to build a nuclear weapon, but not quite enough to cross the line and trigger a military strike. During the Cold War’s nuclear-arms race, however, both U.S. and Soviet red lines provided useful deterrents to confrontation. Though it abhorred Soviet crackdowns against independence movements in Hungary, Poland, and Czechoslovakia, Washington understood that to intervene directly in Eastern Europe would cross a red line. The Soviets went so far as to cross a U.S. red line when they deployed nuclear missiles to the Western Hemisphere, provoking the 1963 Cuban missile crisis that brought the world to the brink of nuclear Armageddon. Moscow withdrew the missiles. The absence of clearly articulated red lines when they actually exist in a nation’s policies can also prove provocative. In an infamous 1950 press conference, Secretary of State Dean Acheson outlined America’s defensive perimeter in Asia and omitted South Korea. Six months later North Korea invaded the South, and the United States found itself in a bloody war. In July 1990, U.S. Ambassador to Iraq April Glaspie met with Iraqi dictator Saddam Hussein to discuss his massing of troops on the border with Kuwait. Many experts believe Saddam interpreted her statement that the United States did not “take a stand on Arab-Arab conflicts” as a green light, and he invaded Kuwait the next month. Once again, the United States went to war to defend a red line it had failed to expressly articulate. According to Brian Michael Jenkins, a longtime national security expert at Rand and the author of the recent book When Armies Divide, red lines are a powerful though dangerous diplomatic tool to be used only when the stakes are highest and the potential consequences thoroughly understood. “And you should never, ever declare a red line as a bluff,” Jenkins said. For the U.S., it would seem this means that it’s time to raise or fold.